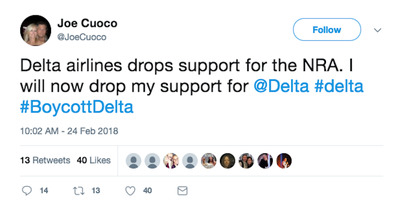 Twitter/@JoeCuocoPro-guns-rights activists are furious that Delta has cut ties with the NRA. 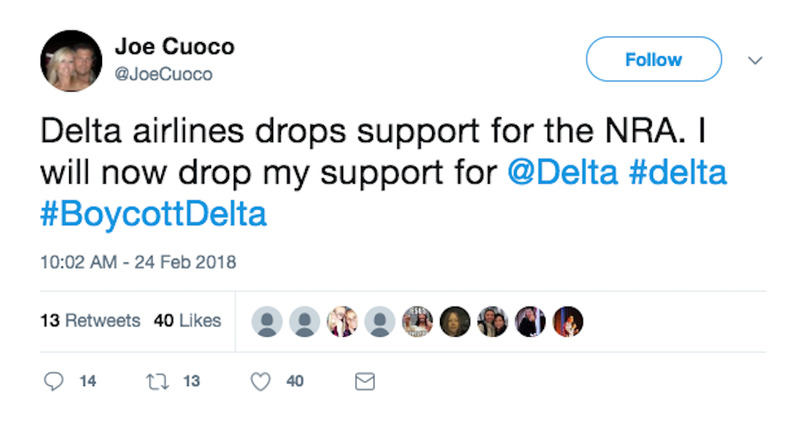 Delta announced it would be cutting ties with the NRA on Saturday. 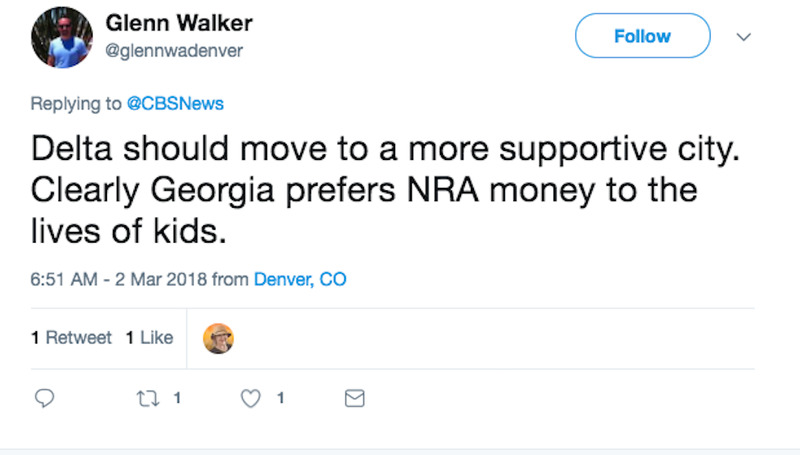 The company is now facing a backlash from pro-gun-rights activists. 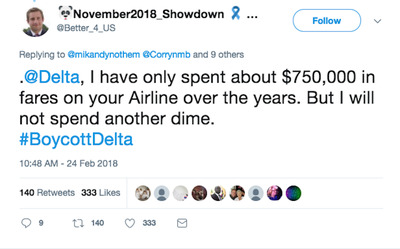 On Monday the Atlanta-based company was targeted by Republican lawmakers who blocked a bill that would have given Delta a roughly $US40 million tax exemption. 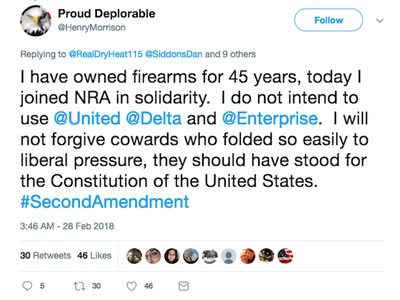 Delta announced last Saturday that it would be cutting ties with the NRA, and now pro-gun-rights activists are boycotting the brand on Twitter. 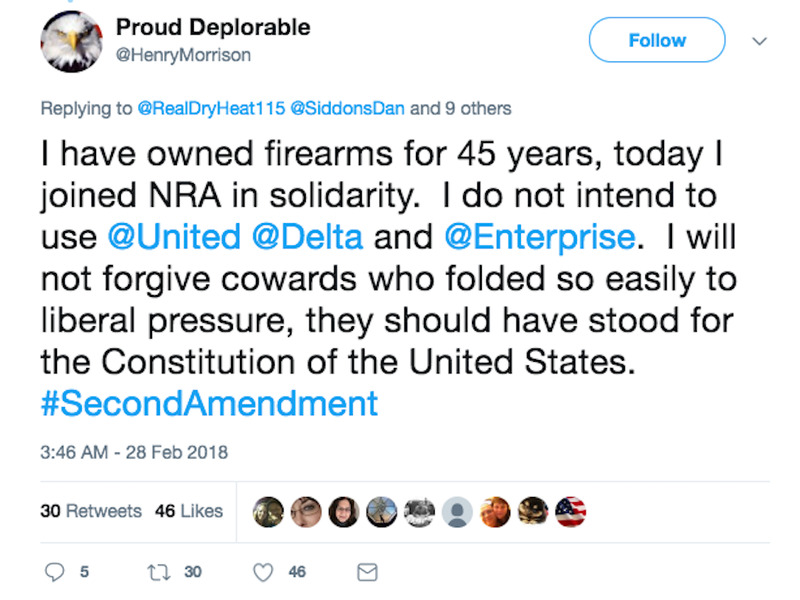 The airline said it would end discount programs for members of the NRA, and it requested to have their information removed from the organisation’s website after the school massacre last month in Parkland, Florida, which provoked a wave of anti-NRA boycott threats. 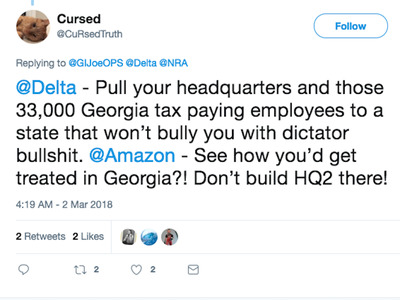 Twitter users are now calling for people to boycott the company. “I have heard from many of you over the last few days. 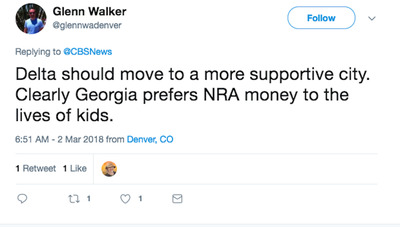 Our people and our customers have a wide range of views on how to increase safety in our schools and public places, and we are not taking sides. Our objective in removing any implied affiliation with the NRA was to remove Delta from this debate,” he wrote. The company has also experienced resistance to its decision from local Republican lawmakers. 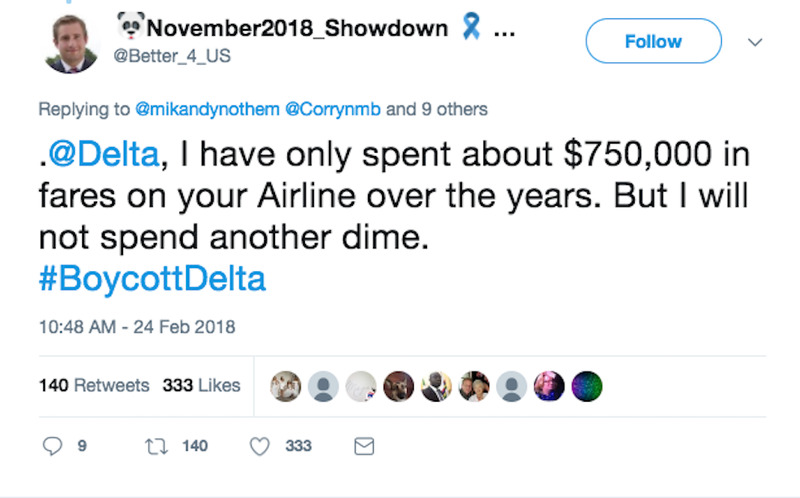 On Monday, GOP lawmakers in Georgia blocked a bill that would have given Delta a $US40 million annual tax exemption, Business Insider reported. The Republican lawmakers described it as an affront to conservatives and said they would block the bill until the company reversed its decision. 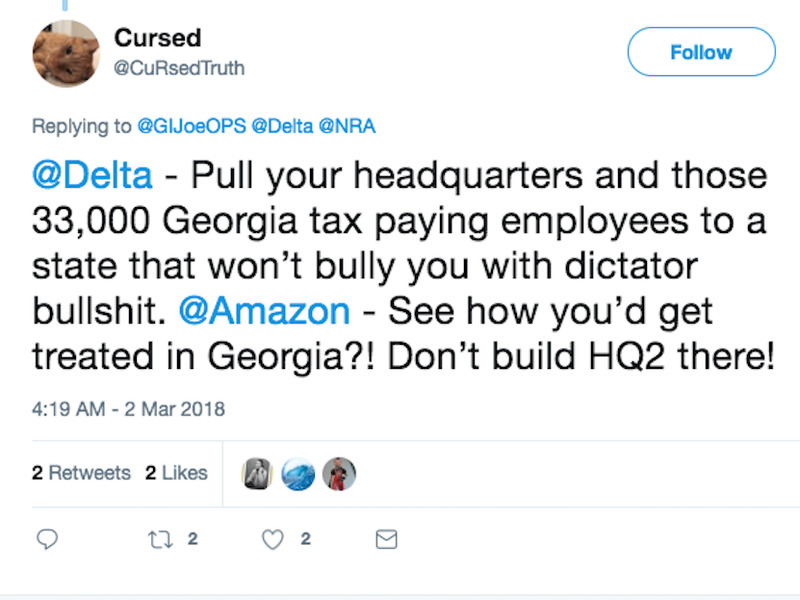 “While Delta’s intent was to remain neutral, some elected officials in Georgia tied our decision to a pending jet fuel tax exemption, threatening to eliminate it unless we reversed course. Our decision was not made for economic gain and our values are not for sale. We are in the process of a review to end group discounts for any group of a politically divisive nature,” he wrote. Some customers are now revolting against the city, claiming that these lawmakers acted undemocratically. It has also sparked a debate about whether the actions of these lawmakers could now cost the state its position in the running to become home to Amazon’s newest headquarters.